During the retreat Angela prepared the meals for us at her home and would then drive the distance from her home to Karyl's home to set up the meals for us. She would then stay and do clean up after the meals. On June 29th she prepared the evening meal for us and then for Friday, Saturday, and Sunday she prepared the afternoon and evening meals for us. The meals were fit for kings and queens and no one went hungry. Her husband David even got involved and grilled hamburgers for us for Sunday afternoon. The only way I can describe Angela and David is, "They are two beautiful people inside and out." Thank you Angela and David for giving of yourselves so freely to us. 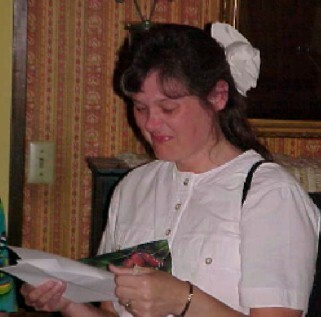 Thank you for the time, effort, and love you showed to us at the POS Retreat 2000 in Pavo, Ga. from June 29 - July 2, 2000. 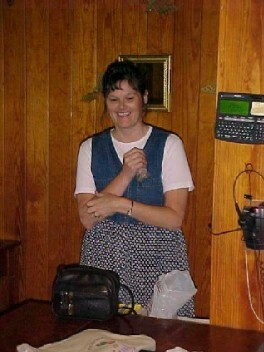 Also for all the work you did helping Karyl prepare for the retreat. We appreciate all your work and we love you for it. On Saturday and Sunday of the retreat we each chipped in a little for a "Love" gift for Angela. Then Sunday evening Karyl presented her with the gift. It was for her and her husband David to use for a "get away" by themselves after all the work they had done for the retreat. 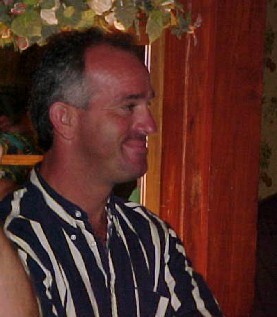 The pictures above show David smiling as Angela read the letter that was with the gift. Below is the thank you letter that Angela sent to us after the retreat. 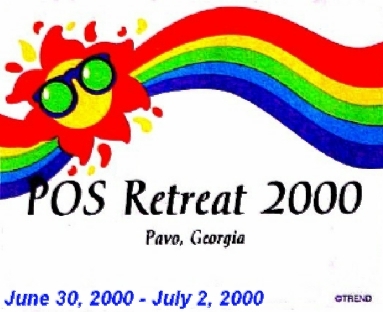 Please forward this message to all who attended the POS Retreat 2000.
people and deserve many happy days. had to be under these circumstances. I hope you have many more years of successful retreats.